Well, new old machine. 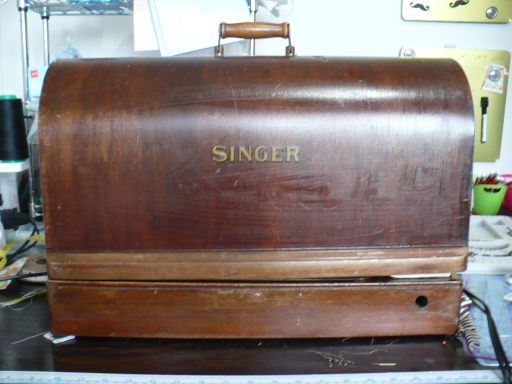 I bought this machine off trademe, which is the nz equivalent of eBay. I'd looked for a while, and most of the machines were seized up, or the people selling them didn't know if they went or not. Or the slightly scary "it goes but you get little electric shocks from it". Hmmmm. After a bit of research I decided I wanted an electric machine (vs hand crank or treadle), a model that took standard needles, and, as I don't have room for a table, a desk top model. Most people online can't tell you the model number when they're selling, but judging from the pictures I had a fair idea this was from the 201 series. And when it arrived it was confirmed, it's a 201k! And reading about this machine online afterwards, it's pretty amazing. This was a top of the line machine, and one site showed an example of a lady who spent the equivalent of 27 of her weeks wages on her machine! One of the other things I wanted in a machine was a case, and I was particularly interested in these curved wood cases, and I got one! 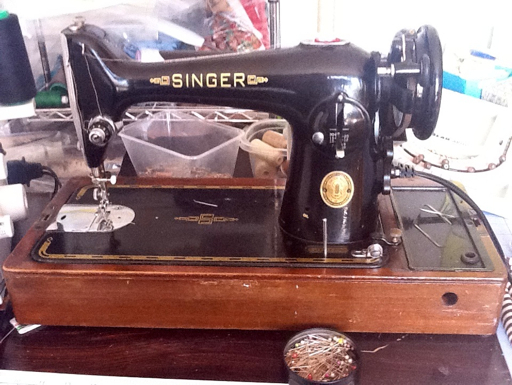 A tune up with my slightly odd but lovely sewing machine repair man and it is going great guns! I Iove the heaviness of the machine, and it stitches a lovely straight stitch. It hates cheap thread and protested loudly and with much jamming when I tried to feed it to it!